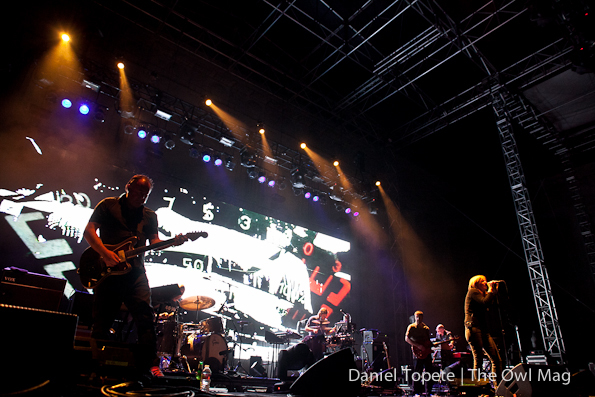 U.K. trip-hop veterans Portishead, in their first American tour since the Clinton administration, slayed the Greek Theater in Berkeley. 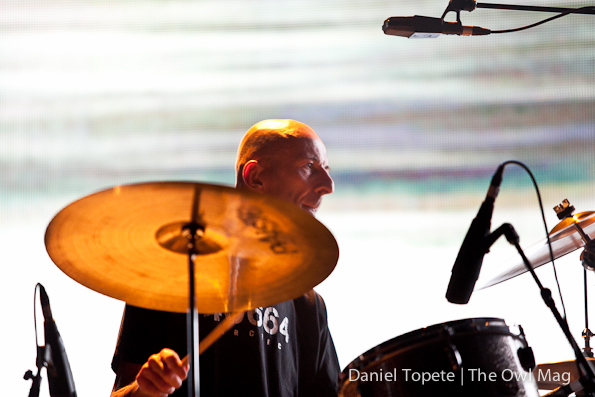 The group’s first two records Dummy and Portishead are sacrosanct in the ’90s alternative music canon (staffed by vocalist Beth Gibbons, and multi-instrumentalists Geoff Barrow and Adrian Utley) and their 2008 comeback performance at Coachella (and attending album Third) is already legendary for its might and majesty. Beyond that, though, there was no tour, U.S. or otherwise until now. After co-curating a few days of the All Tomorrow’s Parties festival, the band’s tour (ending in Denver on the 27th) is incredibly brief and every event is a sold-out testament to the resilience and power of the group. Their set began with the massive chasm of the Greek Theater aflutter in conversation before the lights suddenly went out and the group (accented in live incarnation by bassist Jim Barr, drummer Clive Deamer, and keyboard player John Baggott) one by one took the stage with Gibbons last, whose arrival was punctuated by the deafening screams of her fervent faithful. Roiling into the cinematic churn of “Silence,” every line was an occasion for reinvention. 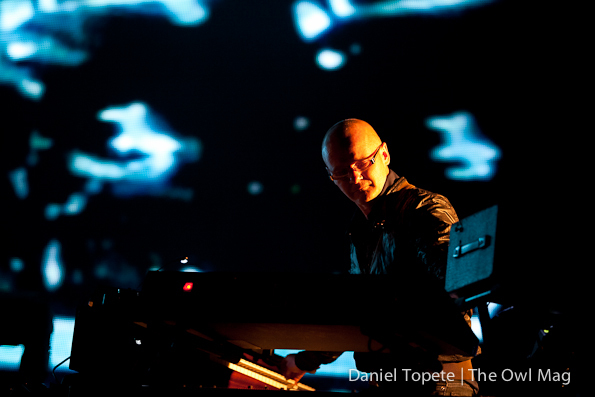 Indeed, it’s gratifying to note that their setlist visited all of the familiar peaks of their discography. For a band whose recorded works consisted of three albums over 20 years and one live album, it’s daunting to note their immense influence: from Phantogram to the entire chillwave movement, these guys are legends. And for the next hour and a half, it was exhilarating watching them prove it. Using the backdrop (but little lighting), the performance was almost confrontational in its intimacy. The band plunged into their second song, “Hunter” which found Gibbons with that wonderful and seasoned instrument of her voice asking “And if I should fall, would you hold me?” Elsewhere, the band aimed for atmosphere and power. 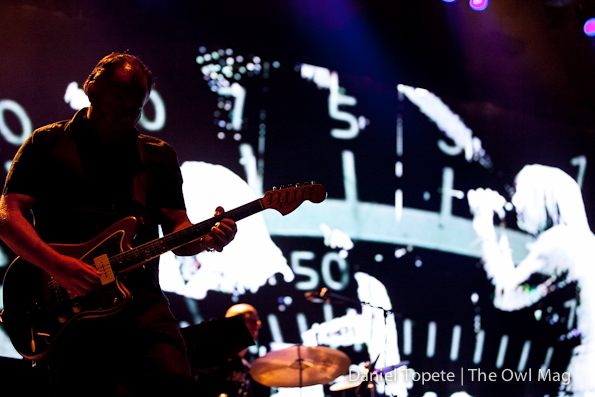 A few songs later during “The Rip,” an acoustic swoon gave way to a synth-driven anthem. Older and beloved material was pretty stripped down: “Wandering Star” found the band at the peak of lounge-rock, with the combined telepathy of the group underscoring Gibbons’ confessions with empathy and solidarity. That said, they knew the strength of attack: “Machine Gun” was as thunderous and jarring as anything I’ve seen at a live show this year. Familiar guitar breaks and band cues elicited screams. It was safe to say that a lot of the group’s California cult was in attendance and the band knew it too. A lot of the set was built around various material because that’s where their hearts are: on progression and growing. Portishead dipped into ’90s material with “Glory Box” and “Over,” which were every bit as heart-tugging and evocative as you could imagine. After a momentous rendition of “Threads,” the group departed, only to return for a two-song encore that featured a surging take on “We Carry On” highlighted by Gibbons jumping into the photo pit and high-fiving the fans. 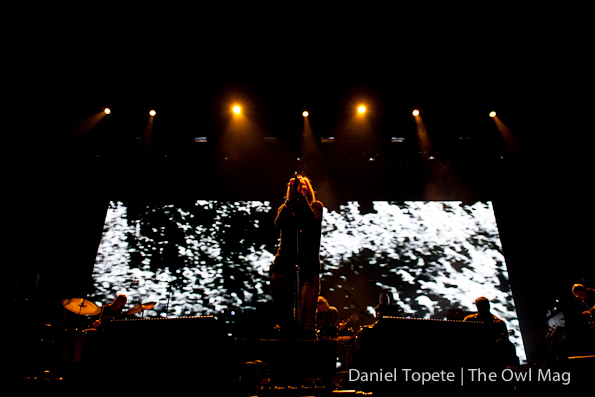 The joy that was felt by those in attendance was nothing short of contagious, though it’s worth noting that Portishead, an iconoclastic and uncompromising as they’ve always been, can tour at their own convenience. See them if you can. 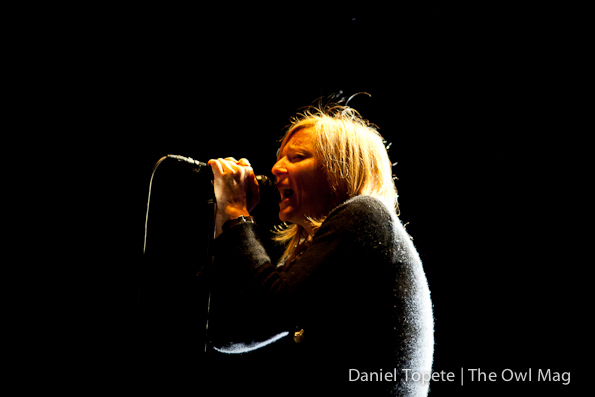 Portishead are back, everybody. Recognize.